Tamako: I read your email. Thank you. Tamako: I sent you reply via email. I also replied you now. Tamako: Just came back from work. How are you? Alan: Did you get my reply to your email ? Tamako: Yes. Are you expecting quick reply? Tamako: You are horrible ... give me time. Alan: How do you mean I am horrible? Tamako: You want me to write quickly. I am not servant who is expected to reply immediately. Alan: Did I ask you to reply me immediately ? Tamako: Your context make me feel so. "I hope I can read from you before bed time"
Alan: No, I said I hope to read from you soon. Tamako: OK understood. But please never give me due timing. Tamako: Do you drive there? How is the temperature there? Is it -15 C deg? Lad does not know how to see weather.com. Avoided to reply to Tamako's question about the temperature. Tamako: I see. how is the outside temperature there? Should be freezing? Tamako: You are outside now? sorry about that. What is the name of your hotel? Tamako: OK, glad to have talk with you. Tamako: Have a nice day. Tamako: Please let me know the name of your hotel? Did not want to share name of hotel, huh? More Kaede 'kick-away' style, please! Hehehe. Now coming close to money request, I guess. So here comes the money request!! Have a nice day today at work. Tamako: Am I obliged to log in and talk with you every day? I want rest today. Bye. How was your night ? It's always a pleasure to read from you once again. The content of your email was understood and well noted in good faith. I understood you have been through hard times, abuse and use by your ex husband but at this point I want to reassure you that you are in good hands because I am willing and dedicated to move this relationship unto the next level. I am not that type of a man who wants to say sweet words for saying sake or simply because you want to hear. My motto is I would rather have you hurt my feeling with truth than to spare my feeling with a lie. I treat people with the up most respect, and expect the same back. I learned because of my long term commitment to my late wife it was about wanting to be with that person in good times and to get through the bad times. Its about being together because you want to, not because you have to. This is not about being with someone just for now or until something better comes along.. I go for long road not the short ride. I have high expectations for myself and any one in my life ... This isn't about material things or money because that doesn't buy you real love or happiness. I have always been independent even when married..no one person should be responsible for another persons happiness ,I believe it's up to yourself to make that happen...I'm looking for that love and won't settle for less.. I know what real love is ..I'm not going to play games with your feelings or mine. We have our family's which is part of us and they are just as important when someone comes into my life. I hope you can feel in my words about trust....and truth..they go hand in hand.......I hope you understand me...I think we both have come across with our wants and needs in a relationship, I think we are on the same page...this seems to be a good start..we can build from here...a good foundation starts a good relationship. Thank you for email. I am tired today. Good night and have a nice day. Thank you for stopping for over and writing me today. Indeed I truly understand how tired you are of working everyday and still find time to chat with me on a daily basis and I must say that I truly appreciate so much effort you are putting into this relationship to make sure we become a successful couple. I would also like to get a word or opinion from you for my last email. I will be going to bed very early today as there is so much work to do tomorrow at the construction site. My client will be coming over for inspection so I have to make sure all hands are on deck. Good night and a have a great day ahead. In order to make decision, I need to meet you first. Please come here to meet me and I will know whether you are as good as you claim to be or not. Email or chat can not decide such qualities. Please, please come and see me. Alan sent invitation to Messenger. Tamako: I don't use messenger. I am still at work now. How are you? I don't use messenger. I am not using smartphones. Alan: And how are you ? Tamako: I am fine, thank you. Busy as usual. Are you busy now ? Alan: Did you read my letter ? Tamako: So you are going to the construction site? Yes I did read but should I reply immediately? No, reply me when you are free ? Tamako: OK, have a nice day and hope you will have good discussion with your client. Thank you always for writing me as I am always excited to read from you, I had a meeting today with my client and thereafter we both went to the site for them to inspect my work. Baby, Let me tell you a bit about my business especially the intricacies surrounding it. When we apply for contracts, we do so by creating the impression that we are capable of financing the contract till the end but once our resources starts running short, we sometime sub-contract some part away OR we invite the people who awarded the contract to come and inspect, once they come around for inspection and we see that they are satisfied with the job so far, then we solicit for advance payment in order to carry on, should they decline then we look for financier who are familiar with this line of business. They usually want contractors like me to complete the project before payment because most contractors end up running away with the money without completing the job. At the moment I am out of cash and my credit cards are max out of limits so I need to figure out some things in order for me to get into flight with sarah and come over to you because I really want to look at the house you found for us so I can sort out the payment formalities. Out of sight is not out of mind. Have a good day and don't forget to smile. Sorry to hear about your situation. Can't you use your ATM card to withdraw from your bank in the United States? Hello dear, thank you for your sympathy about my situation. I have inquire for tickets for me and Sarah to come over to Japan and I am sure it won't take much longer for us to come because my work is at the completion stage after I complete this job and get my balance payment from my client I will jump in the next flight to you. My US bank credit card has exceed limit and also I took a loan from my bank for the project, so I can't seem to access anything from my bank until I pay back the loan which I took from my bank to start this project. I talked with my clients and they insist on making payment immediately the job is done. I just left the site now because i am going to the company where i hired the crane that we use to see if they can change the one we are using at the moment because i think it is parking, it makes terrible noise and we are suspecting hydraulic pressure so, i thought i should take action now before it becomes worse, this has been my fear all night last night and I'm worried about this. I hope everything goes well. I hope the company who hired you will help. It does not make sense if you are not paid!! Tomorrow is Monday. I hope everything goes well tomorrow!! Waiting for you to come here!! Tamako: Hello. How is everything? Are you OK? Your mails are source of energy to me. I just finished from a meeting with my project supervisor and engineer regarding the crane. I will let you know what happens tomorrow, okay? I love you baby. Right now I have my mind in Japan but it's just my body that is in Turkey and eagerly waiting to complete this job and come to you. I can't wait to meet you and get started. I am anxious about what happened to your crane. I hope everything goes well. Busy day today for me too. Please send me email instead of Facebook chat. I can't help thinking about what my life has become when you became a part of it. Waiting and wanting you has been the focus of my thoughts these days, knowing that one day, all that I have envisioned of us being together, will finally happen. You give me reason to wake up in the morning and smile. Just smile for no particular reason except the fact that you are part of me. As days go by I feel myself growing closer and closer and my heart is suddenly coming out of its shy spot and wanting to feel what it feels like to be loved again. I don't ever want to lose this feeling. I don't ever want to lose you. Honey, I only hired the crane from a company and the operator is my site engineer, according to the terms and conditions on the agreement paper which i only read carefully today, i am responsible for any damage or repairs required after 3 days of hiring. I called the crane repairer phone number they gave me they are coming to check it today afternoon before they can give me a quote of what went wrong. I really need to get it fixed because i need to complete the upper part of the job before i can invite my client for inspection so that i can demand for my payment, I don't want them to come and leave unsatisfied..... that will be a real danger. If I can get this done real quick then I should be able to get my payment as soon as possible. I do not know very well about construction but why you need to be responsible to the damage or repairs of the crane? Anyway, hopefully everything settled tomorrow!! I am quickly going back to the site now and wait for them. I really need to get it fixed because i need the crane. Honey, i just hope that the quote the repairer will bring won't be that heavy because i don't even have up $1,000 in my pocket. Please pray for me love! I don't know how to pray, I do not believe in such kind of thing but I wish everything goes well. Tamako: I am fine, thank you. Busy week started. How is your work now? I am worried. I just want to quickly tell you this before I leave for the site, our love is the link that holds our two hearts together and if I could put into words how you make me feel when I think of you, and how much you excite me. You're all that I need and want, Honey. I live for the day that I can sit next to you and whisper into your ear and tell you that I love you, and kiss you ever so lightly but passionately on your lips, and to look into your beautiful eyes as you take my breath away. I live for that first look into your eyes, that first passionate kiss, that first hug and that first time that we make love together. I live to live, to spend a lifetime with you as your partner and to grow old with you, loving you for all times from now to eternity. I love to love you. Thank you very much for your email. You must be really busy now and I am happy that you take time to write to me. I will be late from work due to some issues at the hospital. I will not be online on the Facebook tonight. Please be safe. And I hope everything goes well with you there! Sweetness, I have gotten the report from the crane inspector, everything is recorded in U.S dollar currency. According to the inspector, the most expensive part which needs to be replaced is the hydraulic pressure mechanism, I gave them everything I had which was $2,000 They will be coming back with all the parts on Thursday to fix the crane, the crane inspector told me it will take them about 4-5hrs to fix so, I begged them to come around early in the morning so that we can still work on that day because i need to invite my employers for the site inspection so that i can demand for my job payment. I still need to balance them $6,950 , Please I would need your help on this so I can pay them off Tomorrow and Next, we are going to do some cleaning and maintenance of the ground floor until the crane is fixed by Thursday or Friday depending on when you can raise some funds for me, Once the crane is fixed, 1 week will be enough for us to work on the upper floor to complete this project. I need your help on this issue my love. I hope to get positive news from you. I am very much worried. But I do not know how to do it. My dear love, I know you are very worried and concern about this and me. I need some money to fix this crane and as you already know I have no cash left with me. I need to fix this as soon as possible and I really need you to help with the sum of $6,950. All you have to do is to send the money direct to the mechanic here in Turkey using western union money transfer. I will ask him for his full names and address so you can send the money as soon as you can. Thank you for your concern and helping me. There is no banks called Western Union here in Japan. My dear, Western Union is not a bank. But they operate inside the bank and also have various outlet. You can do western union transfer from any bank in Japan. It's the fastest and easiest way to send money. Western Union or Money Gram which is convenient for you. If not bank, can't do such thing. No such Western Union or Money Gram here, I never heard about it. Ok dear, I understand you never heard about it before. If you like I can figure out a western union or money gram outlet in your city for you to send me the money because they are both fast and easy to send and receive money. Let me know what you think so I can supply you with the payee information. No, I never heard of it and I don't think we have Western Union or Money Gram in Japan. In Japan, we do not have such things. Please provide proper bank account information. I will provide you with the proper bank account information accordingly. Hello dear, below is the account information : You are to pay $6,950 USD. Thank you. Banks are closed by now. I will go to bank tomorrow. The hospital where I work has small bank branch office. 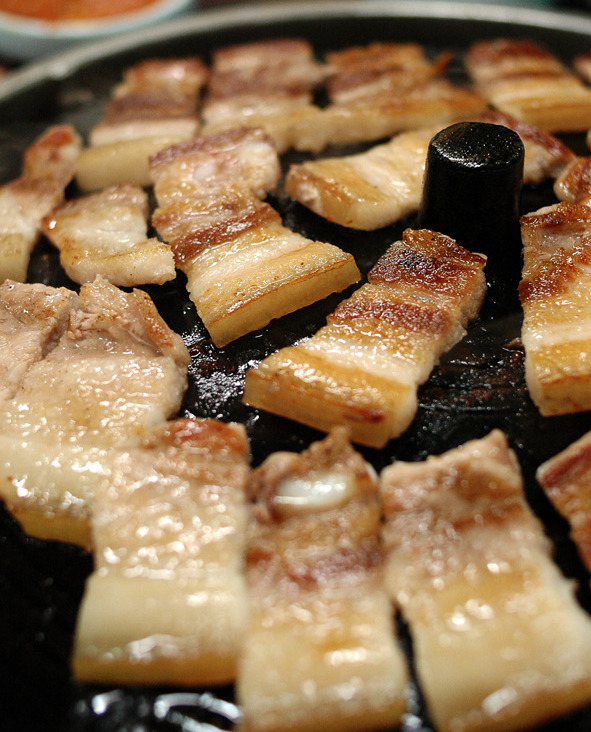 Korean Pork Barbeque for everyone!! I don't know whether this idiot do his homework to provide fake documents for me, hahaha. He is so lazy! Hello dear, thank you so much for your concern, courage, advice and support. I really appreciate it and I am looking forward for you to get the transfer done tomorrow. You have to instruct the bank to make a wire transfer which is more faster than regular bank to bank transfer. You are to also send me the copy of the bank transfer document for confirmation with the crane mechanic. I went to bank branch this afternoon. Because this is international transfer of $6950 USA dollars, the bank is requesting the documents to support the money transfer. Please send me the documents such as commercial invoice, contract invoice etc. which shows the purpose of the money transfer. Please also tell me the name and address of the company. The bank closed just now, so once I get the documents from you, I will go to the bank tomorrow. How are you doing today ? Thank you for your effort so far ! However, you really don't need such documents to before you can effect a transfer from the bank. All you have to do is to instruct the banker and give he/she the payee information for the transfer. Just tell the bank you are sending to a friend in need you don't have to tell them as far as I am using the money for contract purpose. I hope you understand ? Anyway, I will find somewhere to scan the repairing invoice for you to see. Thank you so much and I am eagerly waiting for your reply in this regards. Please, please help me. The bank suspects this money transfer is fraud. So that is why, the banker asked me for the documents that shows evidences. Please provide document showing that this is proper business, not the fraud. Hello dear, thank you for your swift reply. I will send you the repairing invoice shortly when I go out to scan it. This was the notable reason I asked you to use western union or money gram which is very quick and easy to do. You should consider it ! No, there is no Western Onion or Money Grimme in Japan. I never heard of it. So please, send me the document my bank asks. Thank you. The idiot prefer pain with Western Union..
Just type it on google and it will show you the nearest location to you. Type Money Gram or Western union and you will see it. Like I told you I will send you the invoice. they are both secure and very good way to send and receive money. OK thank you. However, the time is late now. And I can not go to Western Union or Money Gram tomorrow. I can go to bank in the workplace facility only. No time to go out. Understood? So please provide the documents so I can go to bank tomorrow. Too quick, no fun!! Need to do another push back tomorrow!! Hello dearest, attached below is the copy of the invoice. I will suggest you use western union or money gram tomorrow so I can get it same day because my client will becoming during the weekend and you know I haven't been able to progress since the crane broke down. If you use the bank transfer then I will have to wait at least 3 working days for the money will reflect in the account that will be until next week. So I beg to consider using western union or money gram. It's easy and very fast. I am back to the hotel now, with so many things on my mind I really want to complete this project, get paid so me and Sarah can take the next flight to you. I miss you... out of sight is not out of mind. Thank you very much. I will bring this to the bank tomorrow. Good night. Hello dear, you still do not understand that I need the money urgent to fix this problem. Bank transfer will take up 3 working days before I could get the money. That is will I am requesting you to use western union or money gram. Tamako won't reply at midnight. Then he changed his tone, to push into WU instead of bank transfer. Good morning your time and how was your night ? You were God's angel sent from high above. You came to give me confidence and so much love. I would die just to show you that I truly care. I'll go to Heaven first just to wait for you up there. I hope you reconsider my position and use the Western Union or Money Gram as they are the only means I can get the money today instead of waiting for 3 working days that will be next week for bank to bank. I hope you understand. I don't know what you mean god's angel. Not sure it is good meaning or bad meaning. However, I did not go to bank during lunch break because you say you prefer Western Union or Money Gram. But as I mentioned, I can not go out from my workplace. You should understand my situation. I work at hospital as hospital administrator. We handle personal information and I am not allowed to go out during work hour. That is why we use bank branch in the hospital. I try to go to the Western Union tomorrow, not today. Understood? I truly understand your position and I am more than grateful for your effort. The content of your email was truly understood and I know you are very busy with your work during week days. I will confirm from the repairer for the payee information so I can send it to you. When you get to Western Union outlet fill out a money transfer form and show your identification and the rest will be taken care by the staff. You have made me so happy and I can't wait to be with you, I want to breathe in your scent and kiss your neck. I always want to be there with you, loving you. But I do not have account information for Western Union. I can not send anything from there without any information. Find below the information of the payee details. I think a limit per transfer is $5000 so you are to make remittance two times in $4000 and $2950 each in different transfer slip. At Japanese WU, as far as I know, they do not allow the clients to split the same payment to multiple transactions in order to avoid client being victimized by the scammers. (Most likely, they have ovserved victims paying by splitting into several batches.) But I do not want to mention this to the lad as excuses, because the lad will think about alternates. I also heard from some victims in Japan that they were warned at WU and could avoid sending money to the lads. But if I say WU warned me, then most likely result with giving some other tips about how to let the difficult vics to go to WU. So let Tamako do something else for excuses. Good morning dear. how are you doing ? I am writing to ask you the position of things if you were still able to send the money. I am not feeling well since this morning. I had vomited and had backdoor trots, severe stomach ache whole day. I went to the clinic nearby my place, and the doctor told me that it is norovirus food poisoning. I can not go out. I can not sit at my computer for long time. What can I do? It's a pity and very sad to hear you have not been feeling well since today. I wish for you is to speedy recovery and also get well soon. I don't really know much about health practices but I am very sure you will be fine after taking medication from the clinic nearby your house. Since you couldn't do the Western Union today due to illness I am certain you can on Monday. I wish I was there right now to take care of you and get well real quick. But as you know I long to hold you and feel your sweet caress. The miles that lie between us will soon disappear, and we will have each other always. I don't care of anything else. All I know is that I love you, and that will never change. Thank you for loving me the way you do. I couldn't ask for more in a woman! i don't have any doubt about you my love and i am prepared to do anything for you my love. The Western Union money transfer did not go well. Tamako's Mother went to ticket office in Osaka on Monday, and Tamako instructed him how to retrieve the MTCN. He tried but did not work well. Tamako: why you change your name? Alan: I didnt change my name,i just added my last name. gorski is my middle name and Sylvester is my last name. Sylvester is like middle name. Gorski is my family name. Tamako: Just opened email. You are angry, are you? You make me scared. You removed me from your facebook friend. You are really like my ex-husband. Alan: Baby that is not the issue ok. I told you never compare me with your ex. I called you a lot of times,you never answer my calls. Tamako: Then never threaten me like that with email. Tamako: I do not reply to calls if no numbers displayed. My ex-husband sometimes call me with no number displayed. Alan: I am frustrated,My project is pending,we have been unable to get work done. Tamako: I am scared of no number display call. You threaten me with the timeline of your project. You will say it is my fault right? Tamako: You threaten me with money. Don't come to me any more!! You really are a bad man!! Tamako: The service can't cancel until expiry date, my Mother said. Alan: If you didnt love me,you should have not wasted my time and my daughters time. Tamako: After the PIN# is expired, my Mother will get my money back. You are bad. Not me. you played with my heard and threatened me. Alan: That is not True. Alan: I dont believe that. Tamako: I do not want to talk with you any more. Alan: You are a lair and a player. Tamako: You make me scared. Alan: You make me scared too. Alan: I called western union and they told me it is all a lie. Your mother never sent any money. Tamako: You only think about money and western union. Alan: Western union told me they dont operate like that. I dont think about money,i think about finishing my project and coming to you. Tamako: No, that is not run by Western Union. Other service handling Western Union and Money Gram, my Mother said. Do you say my Mother is lier? Alan: My daughter stop school because of you.She got all transcript. Tamako: You are so bad! How dare you say my Mother is lier? Alan: I didnt say your mother is a liar. You are the one lying to me. Tamako: My Mother went to ticket shop. Alan: I dont believe you. I do not believe you too. You are fraudster who loves money. Alan: I dont need your money. Tamako: Do not talk to me any more. Alan: I wanted a loan and i would pay back after my project. Tamako: I want to be free from you. Alan: Money is nothing to me. Am not like your ex that loves money. Tamako: Please let me free. Do not talk to me any more. Let me free, no more chat. Alan: Yes i wont talk to you anymore. Tamako: I want freedom from you. Alan: You can have your freedom. Tamako: You really bad man, loving money and western union. Faudster! Chat is blocked but email is not yet blocked. I don't know whether lad will come back with threatening about the project, hahaha. \one to "loan" them the funds! If they were secure in the first place! They would get funding like the rest of do! Work or a bank! Grrr. My daughter quit school because of you? Oh gee, This one is a worthless GIT!! No more contact from this lad. He blocked Tamako on Facebook. Most likely came to aware that he was just being fooled, hahaha. 2. Played on WU modalty. He claimed that he did tried many times. 3. Lad believed that Tamako was another person, who met him on a communication site and switched from the site's messaging system to Facebook. (Unfortunately, I know her and she says it is amazing that the lad believes my fake character was herself.